Where are hip technology companies signing new leases? DTX, Downtown Crossing! Why? It is a great value option with T access from Green, Orange, Red and Blue lines. 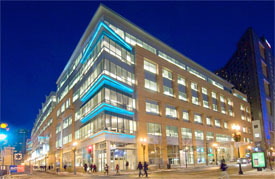 Instead of expanding in Kendall Square with the Googles and Amazons of the world, Sonos recently signed a lease to move into 170,000 square feet in Lafayette City Center, a downtown Boston office complex that long served as back-office space for State Street Corp.
“Once we saw Lafayette, it was clear to me that it was the best place for us,” said Andrew Schulert, vice president of quality at Sonos, which employs 375 people. What Schulert saw was a resurgent real estate market in Downtown Crossing, where hip technology companies are joining new retail shops, restaurants, and upscale residential buildings. The interest among tech firms has benefited downtown landlords who are trying to replace dated department stores and other tenants that have left the area.